Spencer has studied Islam for 20 years, largely, it seems, to prove that it is an evil, inherently violent religion. He is a hero of the American right and author of the US bestseller The Politically Incorrect Guide to Islam. Like any book written in hatred, his new work is a depressing read. Spencer makes no attempt to explain the historical, political, economic and spiritual circumstances of 7th-century Arabia, without which it is impossible to understand the complexities of Muhammad’s life. Consequently he makes basic and bad mistakes of fact. Even more damaging, he deliberately manipulates the evidence. Islam has a far better record than either Christianity or Judaism of appreciating other faiths. In Muslim Spain, relations between the three religions of Abraham were uniquely harmonious in medieval Europe. The Christian Byzantines had forbidden Jews from residing in Jerusalem, but when Caliph Umar conquered the city in AD638, he invited them to return and was hailed as the precursor of the Messiah. Spencer doesn’t refer to this. Jewish-Muslim relations certainly have declined as a result of the Arab-Israeli conflict, but this departs from centuries of peaceful and often positive co-existence. When discussing Muhammad’s war with Mecca, Spencer never cites the Koran’s condemnation of all warfare as an ”awesome evil”, its prohibition of aggression or its insistence that only self-defence justifies armed conflict. He ignores the Koranic emphasis on the primacy of forgiveness and peaceful negotiation: the second the enemy asks for peace, Muslims must lay down their arms and accept any terms offered, however disadvantageous. There is no mention of Muhammad’s non-violent campaign that ended the conflict. Yesterday we had a clip from a mock episode of Hardball from 30 Rock in which it is mentioned, before the political discussion, that Jenna (Jane Krakowski) sang a song called Muffin Top. Here is a video of Jane Krakowski performing Muffin Top. There she goes again. After the recent Democratic debate, Hillary’s campaign released a statement stating, “Hillary was the candidate who demonstrated that she would know how to respond if the country was attacked.” The implication apparently is that none of her opponents would know how to respond. That is not how I viewed the debate, and not how I would characterize her opponents. This attack is reminiscent of Hillary’s previous statement that, “Some people may be running who may tell you that we don’t face a real threat from terrorism. I am not one of those.” She never did identify which Democrats running don’t see the threat. I’m not calling for an 11th Commandment such as Ronald Reagan had against attacking members of his own party. Politics is a contact sport. However, some attacks are counterproductive. Republicans have taken advantage of the 9/11 attacks, despite their long standing failures on responding to terrorism, by claiming Republicans would be stronger in defending America. Just last week, Rudy Giuliani used such scare tactics to argue against voting for a Democrat. It harms the chances of all Democrats, incuding Hillary, for winning in 2008 if such smears are allowed to continue. When Hillary Clinton makes unsubstantiated claims such as these against the other Democratic candidates, she only continues to reinforce these right wing talking points. A candidate such as Clinton who reinforces these smears does not deserve to lead her party, and does not deserve the presidential nomination. The war has seriously harmed the United States, as well as democracy movements around the world, while strengthening al Qaeda and Iran. It is great to see people like Tenet telling the truth now, but they could have served their country far better if they had spoken out before the worst foreign policy blunder in our history. Mr. Obama would not retreat from the Middle East: “Our interests are best served when people and governments from Jerusalem and Amman to Damascus and Tehran understand that America will stand with our friends, work hard to build a peaceful Middle East, and refuse to cede the future of the region to those who seek perpetual conflict and instability.” Yet it’s not clear how this principle can be reconciled with his plan for Iraq: Mr. Obama supports a “responsible” withdrawal of U.S. combat forces by next March. Could this be done without abandoning Iraqi friends and without ceding Iraq’s future to al-Qaeda and other extremists? If so, we’d like to know how. Much of the Bush administration’s usual depiction of the world after Sept. 11, 2001, is nevertheless missing from Mr. Obama’s speech. Perhaps unsurprisingly, he does not use the phrase “war on terrorism.” More remarkably, he doesn’t mention Islam, much less Islamic extremism — which Mr. Bush has described as a critical ideological threat to freedom inside and outside the Muslim world. Mr. Obama’s advisers point out that much of the speech is directly or indirectly devoted to strategies to combat terrorists, counter their recruitment, and rescue failed or failing states. Still, Mr. Obama ought to explain more directly how he views jihadism. Is it an ideological challenge comparable to communism and fascism, as Mr. Bush contends, or merely an esoteric dogma held by bands of criminals, like the anarchism of the early 20th century? Is terrorism the central threat of the early 21st century, or, as some Democratic strategists argue, merely one of a panoply of challenges that include global warming, pandemics and the rise of China? There’s more comment on Obama’s foreign policy views in my Impressions of the First Democratic Debate. Townhall has posted a list of 10 Differences Between Conservatives and Liberals by John Hawkins. Reviewing his list of the ten beliefs held by liberals I found that I do not hold a single one of the beliefs he describes. How shocking. I am obviously guilty of false advertising in the title of this blog. Based upon their list I couldn’t possibly be a liberal. Zero out of ten is a pretty convincing score. I’m sure conservative publications would never stoop to mischaracterizing the views of their opponents in order to make themselves appear to offer the only reasonable solution and to avoid real debate on the issues. The effects of any debate comes in two parts, reaction to the initial debate, followed by how opinion is influenced by the subsequent coverage. As the first debate of the Democratic candidates did not appear likely to change many minds, I waited a day to see the reactions to the debate before commenting. For the most part, preexisting views of the candidates were reinforced. Hillary Clinton, as expected, came off as the most polished candidate and showed that, like it or not, she has an excellent chance to win. While the pundits gave higher marks to Clinton, the early polls show an edge for Obama, probably because so many voters do not want Hillary regardless of how well she debates. There was an occasional mention by the pundits that Edwards seemed out of his league, but his performance is unlikely to have changed any minds. Those of us who don’t feel he deserves consideration for major office will feel the same after the debate, but I doubt that those who do support him had their views of him changed. Even if Edwards could not move beyond his Breck Girl image, he opened up a whole new potential campaign theme, moving from the old promise of “a chicken in every pot” to keeping kids from being embarrassed by their father not being able to pay the prices on a menu. I was most disappointed in Bill Richardson, not because he did a bad job but because he failed to excel as I thought he might in light of his resume. Richardson, unfortunately, is wrong when he says, “They don’t want blow-dried candidates with perfection.” Voters, and even many bloggers, are easily taken in by charisma and fail to look closely enough at substance. 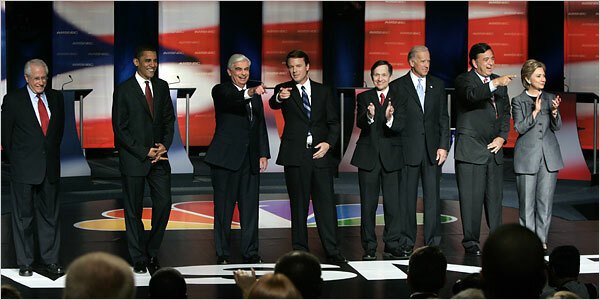 For Richardson to win he not only needs to hold his own but to come out of the debate looking like the smartest guy in the room, much as John Kerry did in the debates in 2003, causing me to get over my brief infatuation with Howard Dean.